The inspiration for this salad runs a few degrees deep. It all started with the California Brunch Special crepe from Crepes-a-Go-Go. This is my Chief Culinary Consultant’s favorite savory crepe to order; it has turkey, cheese, eggs, mushrooms, avocado, tomato, and feta. Seriously delicious. This crepe spawned a great idea by him: an omelet made with chopped avocado, tomato, mushrooms, and feta (and if we’re really hungry, throw in chopped chicken or turkey). Incredibly scrumptious. And maybe healthier than the crepe? Okay, definitely healthier than the crepe. Recently I’ve been craving a “big salad”. Who remembers the Seinfeld episode when Elaine tries to order a “big salad” with “lots of stuff”? That’s exactly what I wanted. I immediately thought about the crepe, and then the omelet, and realized that those ingredients would make an amazing salad. With summer on our doorstep here in the East, a bright crisp salad with fresh ingredients sounded delicious. 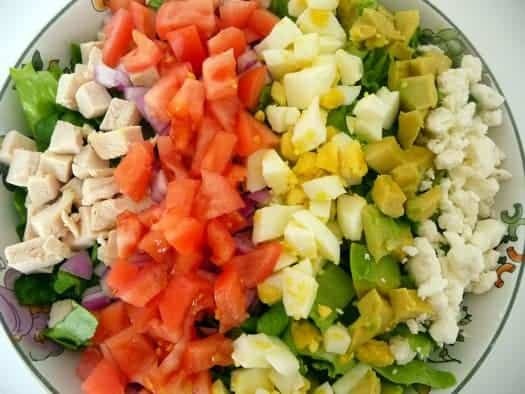 I suppose this could be considered a cross between a chopped salad and a Cobb salad, but the key is to use whatever your favorite fresh ingredients are. Vegetables, chicken, turkey, cheese, whatever you fancy – throw it in and mix it up with this fabulous dressing. 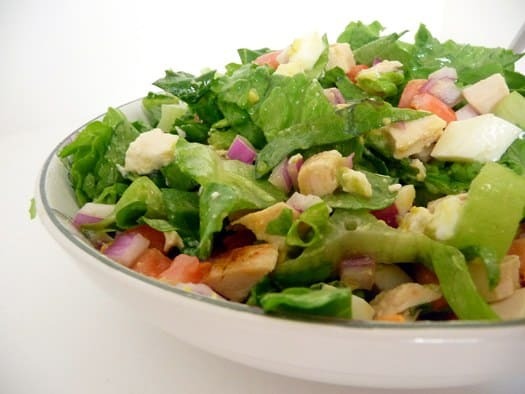 I searched for Cobb salad dressing and found this same recipe on about 10 different websites, so I’m not attributing it to anyone in particular, as I suppose it’s just a classic recipe. What are your favorite ingredients to put in a salad? 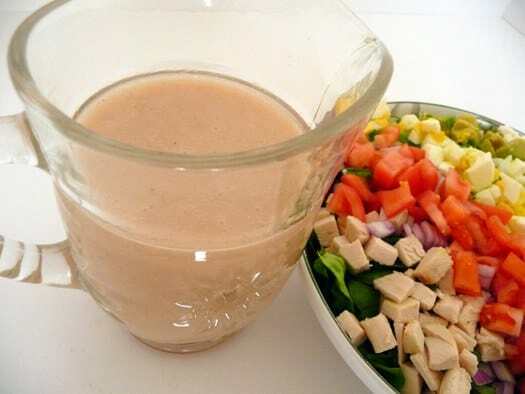 To make the dressing, blend all ingredients except the olive and vegetable oils. Once other ingredients are blended, slowly add the olive and vegetable oils until well blended. Toss with all other ingredients. Store remaining dressing in a covered container in the refrigerator.